I’ve recently redone all of my past video tutorials. 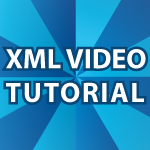 While my original XML Video Tutorial was very popular I felt it needed an upgrade. I’m very happy with the upgrade and I hope you are too. All of the code used in the videos follows the videos. It is heavily commented to speed learning. Here are links to the code used during my newest tutorial based on topic: XML Video Tutorial, XSL Video Tutorial, XPATH Video Tutorial, DTD Video Tutorial, Entity Video Tutorial and part 1 of my Schema Tutorial.